The CO2 Bath is easy to use and operate but there are some things you must know and setup correctly. Safety is most important. Make sure you always have an assistant help you use the bath. And make sure the co2 bath is at least 3 feet off the floor as co2 is heavier than air and accumulates on the ground. And make sure to turn the tank off after the bath has been filled and when not is use. First you must make sure the neck fits tight but not too tight. Before using the bath the first time see how the neck feels. If it is unbearable tight to the point of being very uncomfortable you can trim the neck seal. Additionally you can use a round container such as a 2 liter soda bottle to stretch it out. It should be a few inches larger than your neck and leave it overnight to stretch out. Please make sure to take your time and cut on the line. Before trimming the neck seal it is better to try and stretch it out. for 24 to 48 hours. You can put the neck seal over the co2 tank cylinder. There are 3 hoses. (1) The hose from the CO2 tank regulator to the blue machine. (2) Vacuum hose (3) CO2 to bath hose. The hose coming out of the blue machine is the hose that connects to your CO2 tank. There is a quick connect on the end of the hose and the hose coming from the regulator of the CO2 tank. The vacuum hose is the larger of the 2. It has a 5/8 inner diameter. On the bath it connects to the larger 5/8″ hose barb. It should be tightened on with the hose clamp. The hose for the co2 is on the lower back of the blue machine in the new machines. It’s on the lower front in the older machines. The location on the older and new machines is different but the function is the same. The co2 is the smaller hose. It has a 3/8 inner diameter. 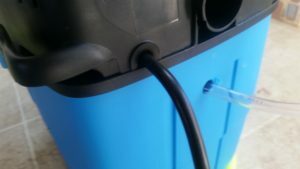 The hose connects to the blue machine using the quick connect. I have created this video showing how the quick connects work for the Vacuum hose and CO2 hose. Each of them connect to the respective hose barbs on the bath. The neck BioSeal is convenient if you have multiple people using the bath with different neck sizes. So a person with a large neck can use the same bath comfortably as someone who has a much smaller neck. The material of the neck seal is sticky so will adhere to the neck seal.